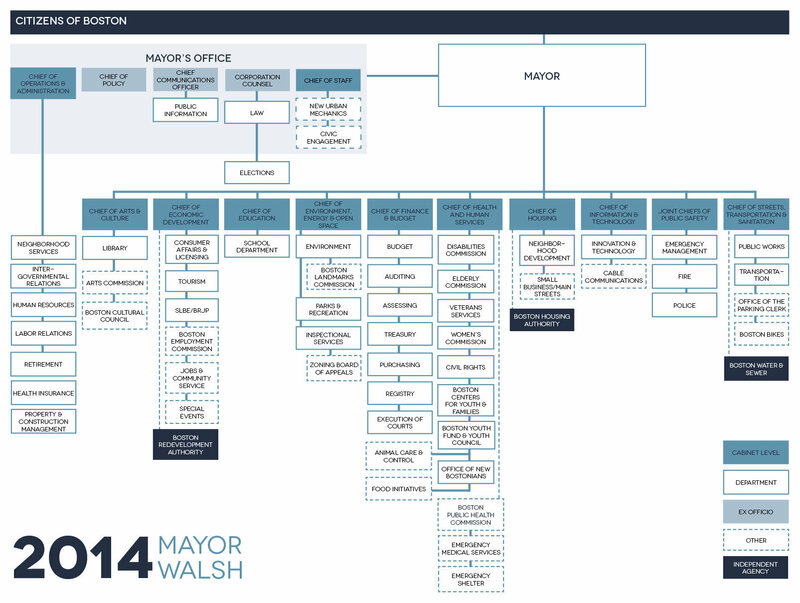 On Jan. 29, 2014, the Walsh Administration announced its plans for reorganizing Boston’s mayoral cabinet. Reporting directly to Mayor Marty Walsh will be the Police Commissioner, Superintendent of Schools, and eight other cabinet officials—including the newly-created Chief of Arts & Culture, who will oversee the library as well as an Arts Commission and Boston Cultural Council. During the mayoral campaign, Walsh was the first candidate to pledge to hire a cabinet-level arts commissioner, and his fulfillment of that promise is historic. We expect that the city will benefit strongly by having a commissioner of arts and culture at the policy-making table. If nothing else, coordination with other city initiatives related to education, public safety, and economic development that might not have been otherwise possible might now take place. Other cities that have made arts a political priority by naming cabinet-level arts commissioners have reaped the rewards. In 2008, Philadelphia Mayor Michael Nutter established by executive order a Philadelphia Office of Arts, Culture, and the Creative Economy. He also hired a cabinet-level Chief Cultural Officer for the city who reported directly to him. In just five years, Philly’s arts czar brought in federal grant money to Philadelphia for arts and cultural initiatives, and additional private investment, including a three-year $9 million Knight Arts grant. Perhaps most important, Philadelphia’s arts commissioner acted as an ambassador for the arts among other city department heads and helped coordinate arts initiatives in the schools and elsewhere. Chicago Mayor Rahm Emmanuel has seen similar success with his arts commissioner. Just one year into an arts policy strategic plan overseen by his arts commissioner, the city saw 60 percent of Chicago Public Schools complete Creative Schools Certification, which rates schools based on how well they are bringing arts instruction and opportunities to students. Chicago’s arts commissioner also re-launched the city’s online Cultural Grants Program, which awarded 200 grants totaling $1.2 million. And the inaugural Chicago Theatre week sold 6,200 tickets to 300 performances. We look forward to working with the Walsh Administration and its new Chief of Arts and Culture in bringing strategic arts planning—and of its benefits—to the city. For the first time in Boston's history, the mayor's cabinet will now include a position dedicated to arts and culture. The Rainbow Times covered our reaction to Mayor Marty Walsh's history-making announcement that he will hire an Arts Commissioner. This bold move toward elevating arts and culture in the city bodes well for the conversations Create the Vote had with Mayor Walsh during the mayoral campaign about this position. “During the mayoral campaign, Walsh was the first candidate to pledge to hire a cabinet-level arts commissioner, and his fulfillment of that promise is truly groundbreaking"
On Saturday, January 25, Mayor Walsh's Arts and Culture Transition Committee held a public hearing as an opportunity for the creative community to share what they want to keep, implement, and dream up for the sector. The community came out in droves, ready to ask the important questions and share their invaluable insight in this public process. In the room and online, the energy was overwhelming. Twitter was so abuzz that the event's hashtag, #bosarts, trended up to the number 4 spot nationally. Relive the action from the public hearing, captured in event highlights by our Storify piece. Almost everyone would agree that the arts are vital to creating thriving communities. The problem for lawmakers is that it can be hard to justify to constituents that arts programs deserve funds that otherwise might go to police departments or public schools. But arts advocates received some powerful ammunition on Dec. 5 in the form of a preliminary report that states that the arts and culture sector contributed a whopping $504 billion to the American economy in 2011. Leaders across the country — such as Mayor-elect Martin Walsh — should take note. You can find a summary of the NEA report with links to the data here. This editorial is just the latest in a series of strong news and editorial coverage on the arts from the Globe. A piece by arts reporter Geoff Edgers on Boston Mayor-Elect Marty Walsh’s plans for the arts community. Another piece by Edgers about what local arts museums leaders hoped to see in the next mayor. A highly entertaining and nuanced look at the state of public art in the city by Globe art critic Sebastian Smee. A strong editorial lamenting the burdensome maze of permitting that Boston artists must submit to in hopes of getting approval for their projects. Working off his recent promises to bring revenue streams and a Cabinet-level commissioner to the arts community, this week, Mayor-elect Marty Walsh added 21 people to the arts and culture team of his transition committee. This represents the next phase in Walsh's commitment to the creative community in Boston. Visit the Boston Globe to keep reading about Walsh and his advocacy in the arts community. Mayor-elect Walsh has already begun his transition phase which means the Create the Vote coalition needs to continue advocating for arts and cultural issues. In a discussion with Steve Annear of Boston Magazine, Ron Mallis of BostonAPP/LAB, producer Jason Turgeon of FIGMENT Boston, Liz Devlin of FLUX Boston, and Matt Wilson of MASSCreative talk about working with Walsh to make art a priority in his administration. In the meantime, these leaders will collaborate and write an open letter to the mayor to address his next steps. Additionally, Mallis has taken his involvement a step further by applying to be on Walsh's transition team to represent the arts. But the engagement doesn't end there. In the coming months, it will be up to the whole creative community - spanning across disciplines and working in neighborhoods around the city - to reach out to Mayor-elect Marty Walsh and work with him in solidarity. Read the entire piece over at Boston Magazine's page. In the fourth entry in Laura Mitchell's blog series, Art in the Innovation Hub, she considers the infrastructure supporting the arts scene in Boston. First, Mitchell explores how the Boston Center for the Arts serves local artists with a space to experiment, a venue to curate, and home away from home to nurture. Conversation eventually turns to neighborhood organizations and their crucial role in identifying cultural indicators. Without committed groups like the Dorchester Arts Collaborative, these up-and-coming artists have no easy path to exposure. Jay Gustavo, president of the collaborative, commented that the creative sector is experiencing progress in working cohesively with each other in the ecology of art in the city. Gustavo praises the creative community for coming together, and gives props to MASSCreative for its advocacy, saying: "the city can no longer afford to not listen to us." From the I AM KREYOL Art BaZaaR show at the Erick Jean Center for the Arts, Dorchester Arts Collaborative. Courtesy of DAC.